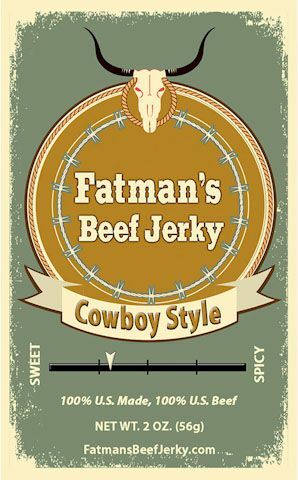 Fatman’s Beef Jerky was founded in 2007 on years of experience in the beef industry. Rick Robey was in the cattle business and meat packing business in Eastern New Mexico for over 25 years and knows the beef business well. He has used that expertise to bring this exciting, flavorful product to market at a competitive price. Rick also understands the value of hometown customer service… when you place Fatman’s Beef Jerky in your store, you will experience it first hand. Here’s an opportunity to sell the exceptionally flavorful beef jerky from the New Mexico kitchen of Rick & Ellen Robey. Fatman’s Beef Jerky sells itself. • We currently sell throughout the United States! • We add no preservatives. MADE WITH 100% AMERICAN BEEF!!! Our All-American beef jerky products can be found in convenience stores, grocery stores, bars, restaurants, lumber and hardware stores and farm and feed stores throughout the United States. Turn rates quickly began attracting distributors and our beef jerky continues to see increased demand. Fatman’s Beef Jerky features packaging and labeling that is modest and simple—it provides an image of a homemade, natural beef jerky product created and produced solely by the Robey Family. Our beef jerky is packaged in a transparent plastic zip-lock bag and the labels are color coded by flavors. The label has a bar code, lists ingredients, weight, flavor and features Fatman’s name and logo. We also now feature an American flag on the package, for we only use All-American Beef! Fatman’s Beef Jerky comes in thirteen delicious flavors. Not only is it free of added preservatives, but it is lean, packs plenty of protein and is low in calories. A two-ounce package of peppered jerky may have 130 calories, ¾ gram of fat and almost no cholesterol. No premade or bottled sauces are added to create the unique flavors… only fresh ingredients. A large segment of the market wants a unique taste. The jerky consumer may have favorite brands, but many are looking for new flavorful choices. Our jerky has been discovered and it’s getting rave reviews! 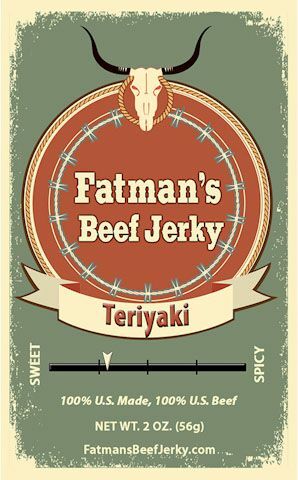 Fatman’s jerky is in many stores throughout the United States and we easily outsell commercial jerky. Fatman’s Beef Jerky is a gourmet, specialty jerky made from all natural ingredients, using excellent quality meat and unique flavorful recipes developed in our kitchen in Roswell, New Mexico. Our jerky is dry but tender with a delicious taste and consistent, appealing textures. Our facility is USDA inspected and all of our products are made with 100% American beef, no preservatives added. Consumers want it…and you can bring it to your stores now and capture a profitable new market segment. Fatman’s Beef Jerky is excited about the prospect of doing business with consumers all across America. We’re proud of our product line and we hope you give us a try!